Now, I’ll be honest. Â I was going for the win today with the Marcolian Purchases Writing on the Mall story line that played out today (it was a joint April Fool’s day joke…the Facebook and Twitter feeds posted articles from the Marcolian, and the website bounced you directly to the Marcolian website. Â I hope you guys enjoyed it. Â Special thanks to Alison Matas and the Marcolian for letting me play the prank. Â I hope their page visits shot through the roof), but there may be somebody that beat me today :-(. Enter the Fake Senior Week Event List (click for full size). I added the watermark on there since I’m publishing it. Â This is NOT something we put out, don’t worry. please disregard them. Thank you for your time, and enjoy the weekend! Of Course, the actual list of senior week events is much less controversial, or at least from the college’s perspective. 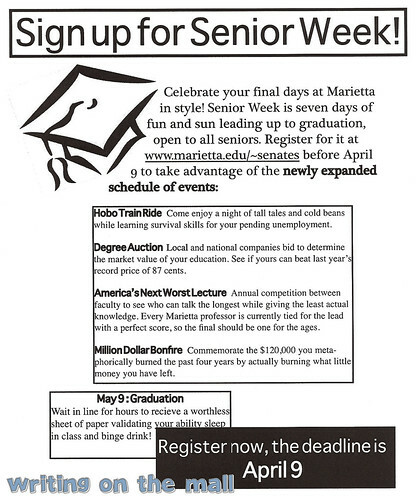 Â You can find the whole list of actual 2010 Senior Week events, and how to register, at the Student Senate website. The writers for the Marcolian decided to have some April Fool’s Day fun for this week’s edition. Â The paper copy came out on Thursday. Subjects of the pranks are the new Planetarium and the protected structure by Dyson-Baudo Rec Center. The second story says that students are stuck waiting for a Marietta College bus that will never arrive. They’re alright reads. Â Better than the college PR that currently fills the Marcolian (for the most part) now.